The Worlds of John Brewster Jr.
John Brewster Jr. (1766-1854) was one of the most prominent early American portrait painters. His hauntingly beautiful portraits have a directness and intensity of vision that were rarely equaled, as the images in this book attest. Brewster’s portraits have sold astonishingly well at auction, and his work is featured in the collections of prestigious museums, yet curiously little has been written about the life of this deaf artist. Traveling the New England coast to paint the portraits of the merchant class that arose after the Revolution, he lived precisely when a Deaf-World-with its own language, social institutions, and culture-was forming. 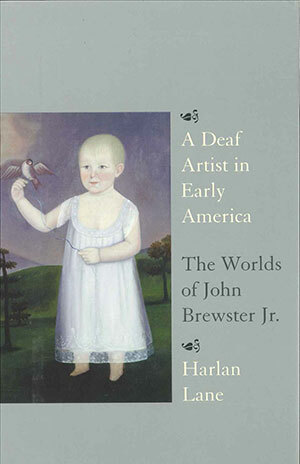 Harlan Lane, award-winning historian of the Deaf, argues that deaf people are often visually gifted, and that Brewster, as a deaf artist, is part of a long and continuing distinguished tradition. Lane’s unprecedented biography both vividly and comprehensively explores Brewster’s worlds: he was a seventh-generation descendant of William Brewster, who led the Pilgrims on the Mayflower voyage; he was a member of the Federalist elite; a Deaf man; and, finally, an artist. In 1817, at the age of fifty-one, Brewster attended the first school for the Deaf in America, the Connecticut Asylum for the Education and Instruction of Deaf & Dumb Persons. It’s extraordinary to imagine that this was the first time he experienced fluent conversation and real social and intellectual exchange. Yet, as Lane notes, Brewster’s ambivalence about this minority reflects the difficult choices confronting many Deaf people, then and now. Including little-known information on the French roots of the American Deaf-World; the Deaf communities of Martha’s Vineyard, Maine, and New Hampshire in the nineteenth century; and on contemporary Deaf art, A Deaf Artist in Early America provides a multifaceted glimpse of Brewster, New England history, and the distinctive culture, language, and social institutions of the Deaf in America.